I am seeking your opinions on what type of role this sword would have performed. When I purchased it I was told that the brass hilt is of English manufacture whilst the blade was likely imported from Germany. There are no discernible maker's marks although these may be covered by the patina. It is very light and agile with a 29 inch blade which is still dangerously sharp despite not appearing to have been honed for a long time as the patina is uniform across the blade. One of the vendors surmised that it was a 'short man's riding or broadsword' due to the shape of the blade which whilst being extremely agile is broad enough to make an effective cutting implement. After handling the piece and researching similar pieces of the time, I have developed a different opinion which is why I am seeking further input. FIrstly - the handle is not shorter than other pieces of this era which I have handled and own which possess longer blades of 33 -35 inches. I am 6 foot tall with relatively large hands and the handle is in no way constrictive when I hold it. In fact it fits very well and allows for a 'hand-shake grip' which seems ideal for handling this piece. My theory is that this was not so much a sword designed for heavy use by a small man but that it was a light fencing and self-defence weapon for everyday carry with a blade of short-sword or hanger length which is somewhat unique due to its breadth which makes as already mentioned for an effective though light cutting weapon. Based upon the images and your knowledge of swords used in this era, what sort of use and context would you suggest this sword was designed for? Sorry again - have read instructions on how to attach an image and have followed them so not sure why this isn't working. A shorter blade could also indicate that the blade was broken and reshaped during its working life. Interesting suggestion - I hadn't thought of that and I guess it's certainly a possibility. The overall shape of the blade does not seem to suggest any reshaping of the upper section however unless it were done very carefully over the entire length of the blade. Are any of the moderators able to suggest what I may be doing wrong in attempting to attach images? They are under 250 KB and I am following the specified procedure so not sure why this isn't working. It's difficult to help without knowing exactly what issue you're experiencing. If you're locating a file of the correct size and format on your hard drive and clicking Attach, and if you haven't exceeded the 20MB allotment your membership type has for forum attachments, it should work. If something is amiss, it usually shows you an error above where the subject line is on the posting page. Are you receiving errors? Please contact one of us privately if you continue to have issues. We'd be happy to help. I would agree with your supposition. This style of sword, I believe, would have been favored by those who used a style of use that was more in line with combat associated with military training of the period while still following the fashion of the more civilian styled smallswords that where the vogue of the day for gentleman. I have come across several swords in similar forms with a wider blade and of approximately this length. Today we have a tendency to go longer for blade lengths in many cases than the probable average of the day indicates. Lots of reasons for this and probably best as a seperate discussion. The piece you picture would be a very serviceable sword for lots of situations. In this period it was often the habit to carry a stouter piece when traveling then the smallsword one might wear in teh city. I know there is a reference to teh clergy often carrying hangers when traveling as one should not go unarmed in that day when on a journey of realy any length. Some examples will even have down sized swept hilts as apposed to smallsword hilts. Thanks so much for your response. In hand it certainly feels like a solid yet elegant and very portable and servicable little sword. I'm actually quite taken by it and haven't seen many similiar weapons in contemporary depictions. Would this fit what you refer to as a 'stouter piece for travelling' or would this be more an about town piece in your opinion? And in terms of it provenance would the time of circa 1690 seem about right? Judging by the larger D shaped guard, I would say 1690 is a good estimate. The hilt appears to be made of brass, is that right? If the hilt is brass, then late 17th century would be correct. 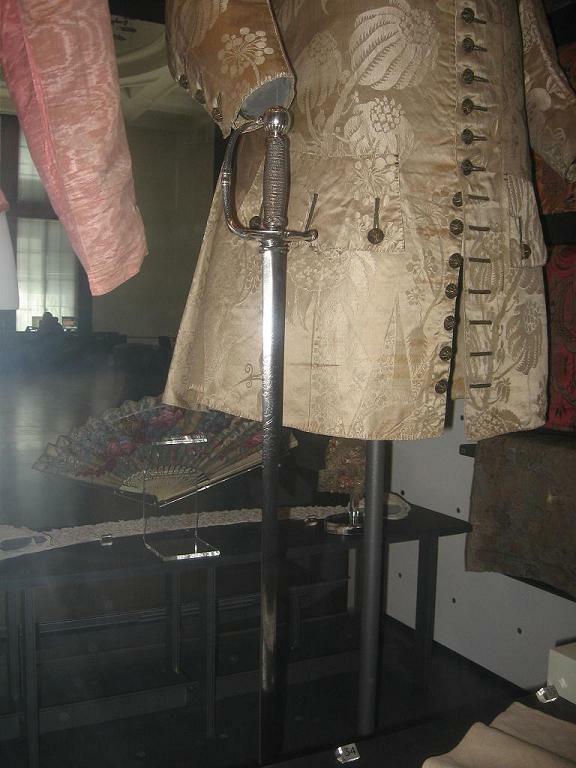 If the hilt is iron, then a date as early as 1650-1660 is quite possible. My guess would be 1680-1700. Many thanks for your reply. Yes, the hilt and pommel are all of brass. Was this hilt type coupled with different blade types? 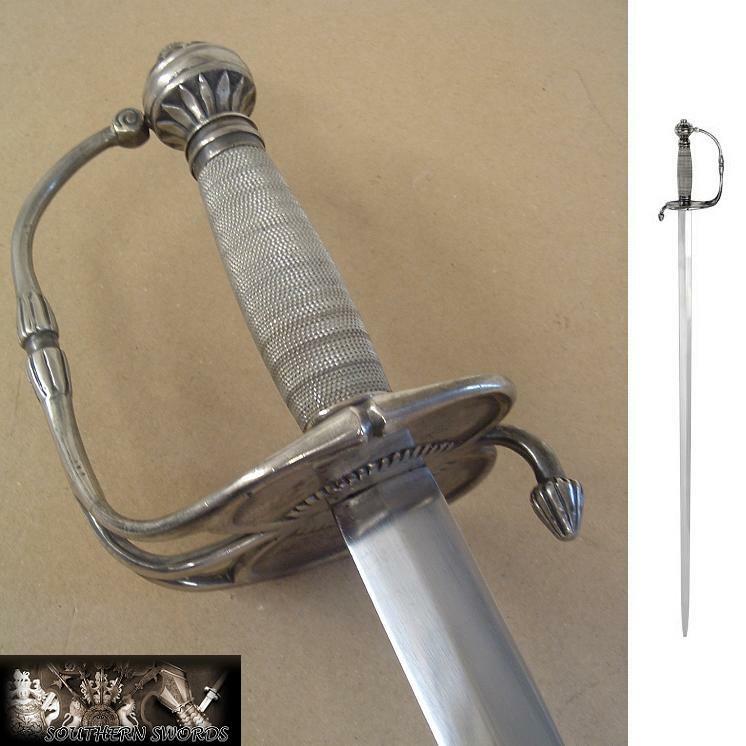 If you like this style of sword, can I just mention that the Scottish swordmaker John Barnett makes a very close (and very inexpensive) replica (with a solid brass hilt, plated with an antique 'silver' finish). We use these (with fencing blades) in the salle. They are solidly constructed, although the original sharp blades are usually poorly heat-treated, but are easy to swap out. Thanks for the tip. I'm a big fan of this style and have been fortunate enough to acquire a couple of originals of a similar type, the one pictured in the above attachments being the smallest and lightest of them. What I find especially cool is that despite their age certain such pieces still exist in functional condition. The one pictured is solid in the hilt and sharp in the blade at over 300 years of age. Whilst modern reproductions have never held quite the same appeal for me I can understand their usefulness as fencing tools. Do you train with a group using these? And if so where? I'm based in London and would be interested in checking such a thing out. Regarding the type of blade that goes with this hilt, I have seen three main types. I've seen a broadsword pattern, similar to yours. I have one that has a backsword style blade and I have seen others with curved, saber style blades. Although, a few of those swords may have been composites. Thanks Jonathan, for the pics of the JB original. Thanks Jonathan. Will keep an eye out for that piece in the V&A next time I visit. That's interesting Don as I had assumed that such relatively small hilts (compared with the more complex and robust basket types) were mainly paired with slender, thrust oriented blades. That assumption is most likely based on the similarity in my eye between this hilt type and later small-sword hilts. The smallness of the shell guards and the presence of only a single slender knuckle bow (?) caused me to think that this type wasn't built for the heavier cutting style blades which you have informed me are often found with this hilt style. I suppose the reduction of the overall guard size and complexity in these types relative to the more substantial basket types of the era which carried similiar blades was driven by fashion and 'about town portability' more than anything else? Thanks Julian, will check them out. As to this being somewhat of a cross between a small sword and spadroon type hilt - when did the spadroon type come into use? I had thought this was later, after the proliferation of the smallsword throughout the 18th C and therefore perhaps a reversion to a more robust and versatile sword not limited soley to the use of the point? Please excuse any errors as I am writing this from a phone. At last I can contribute, if only in a marginal manner! 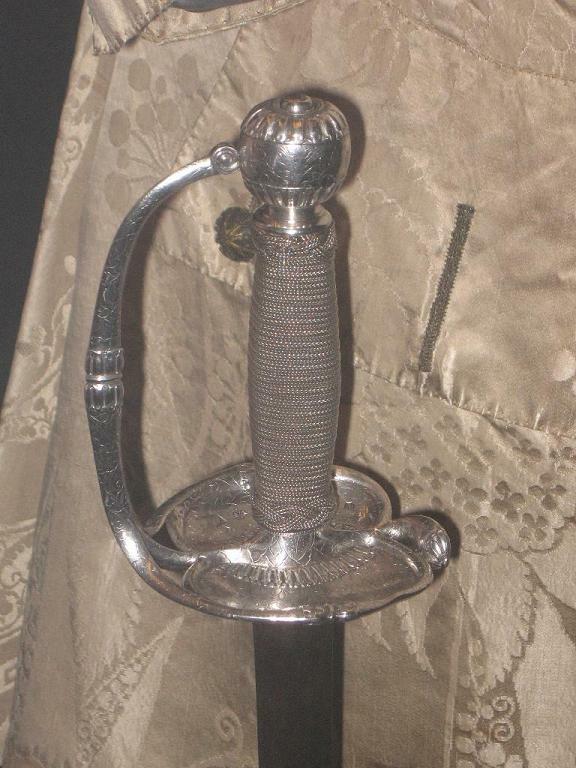 I believe that Glen Cleeton and David Ledoyen each show quite similar swords in a thread began by Morgan Butler, "Show us your 18th century swords!" The similar swords are shown beginning on page three of that (wonderful) thread, mounted with both backsword and broadsword blades. That whole thread is, perhaps, my favorite thread on the whole site. That's a sword to be proud of, sir! Lewis thanks very much for bringing that excellent and very informative thread to my attention. I didn't realise such a wide range of blade and hilt combinations existed during this period and it seems that my assumptions around what combinations were commonly produced were overly restrictive. I guess the tendency to classify can be a tricky and clumsy exercise if undertaken with limited knowledge of the range of individual types one would seek to put into distinct groups. Of particular note are the numerous small hilts fitted with broad cutting blades and the heavier basket hilts with light, thrusting blades. 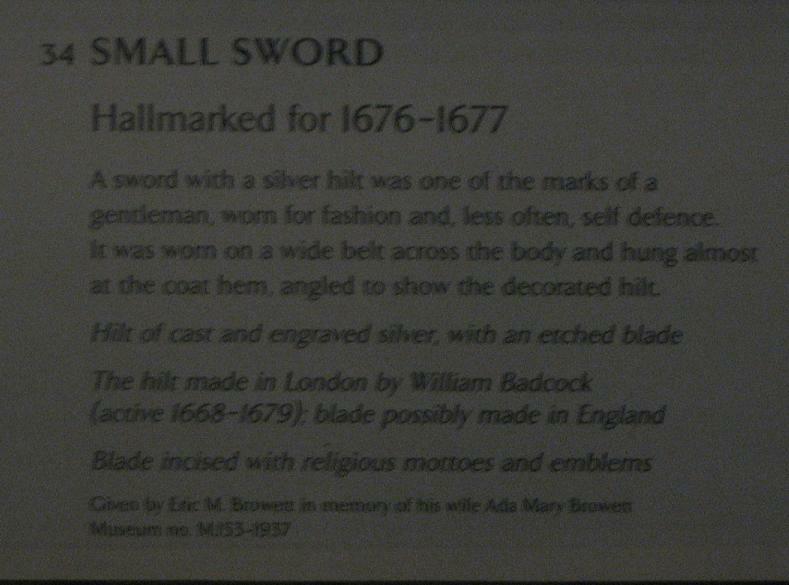 These examples seem to reveal the blunt, loose nature of broad classifications such as 'small sword' and 'broadsword'. Apologies if I seem a recent convert preaching to the choir!